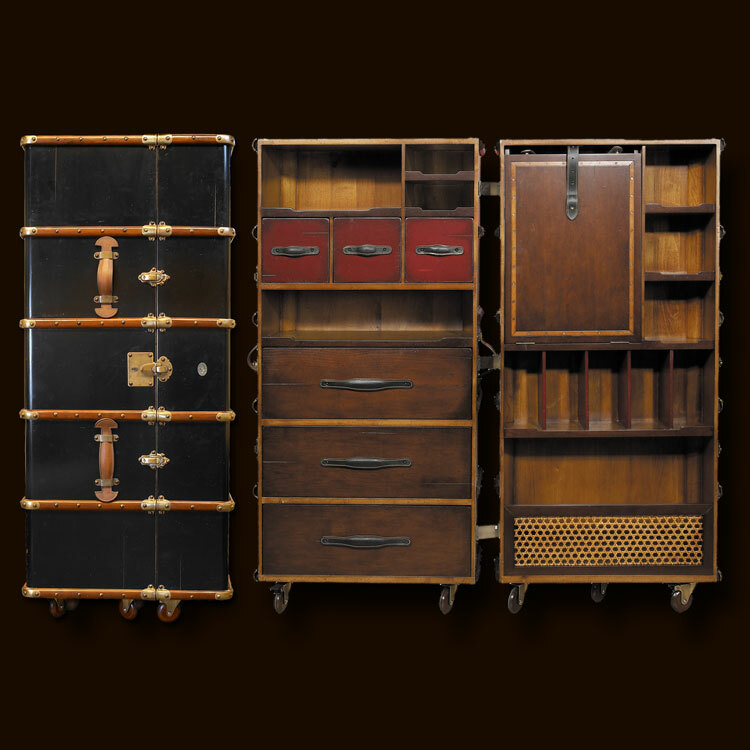 Ref: MF077B Early 19th C. French Louis Vuitton and Goyard trunk and luggage workshops exported to the traveling upper classes of the world. As trunk-making techniques became more advanced, these makers produced virtuoso examples of the French styles. 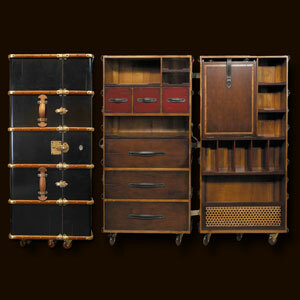 Complete traveling closets were made to accommodate the elaborate dresses, suits, and uniforms of the Belle Époque. Inspired by originals from the turn of the century, AM introduces a collection of nostalgic but highly practical trunk reproductions. The Armoire features a multitude of shelves and drawers to store and display. Hand-sewn bridle leather straps and brass hardware support a foldout shelf for use as workspace. It opens to a removable, inset shelf-unit with a removable mirror stored in the back. The rattan compartment underneath will hold laundry and shoes. Fun, decorative and practical. Custom made, solid brass hardware. Bridle leather handles and straps. Locks with keys. Seven wood and rubber wheels, of which four will lock.